I adore fennel, not only for its feathery greens (which are a wonderful substitute for dill), but for its crisp texture and its faintly sweet flavor. Fennel, is, to my own sensibility, a vegetable that doesn’t get much respect here in the U.S. It has a faint anise flavor and a gentle sweetness that pairs well especially with fish. You can do so many things with it – as part of a mirepoix or battuto; as an ingredient in bagna cauda or as part of a crudité platter. It can appear as a gratin, or as an unusual ingredient in a vegetable tian. One of my favorite preparations is fennel and either green or wax beans, sautéed in olive oil, with chopped shallots, plenty of freshly milled black pepper and mint. I eat some variation of this salad on an almost weekly basis throughout the winter and early spring. Besides celery, there is “insalata di finocchi con olive e arance” (fennel, olive and orange salad), and fennel and mushroom salad with Parmigiano-Reggiano cheese. If you don’t have a mandoline, shave the fennel bulb with a sharp kitchen knife. 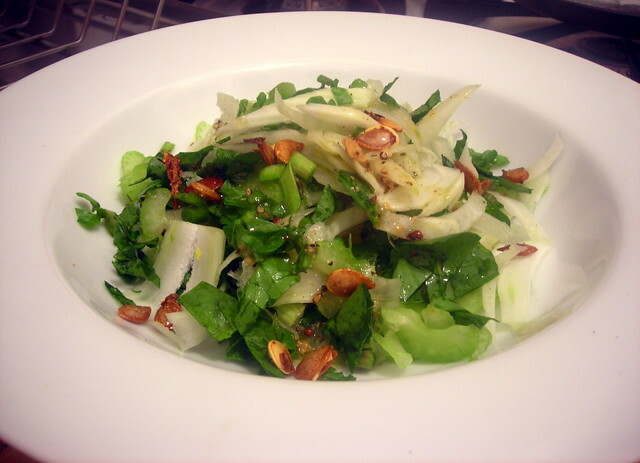 Shave the fennel thinly with a mandoline, then place the shavings in a large bowl. Add the celery, celery leaves and watercress. Mix well. Warm olive oil in a skillet or small saucepan over medium heat. Add the pumpkin seeds. Stir once or twice. When the seeds “pop”, after about 1-2 minutes, remove from heat and spoon the seeds onto a paper towel-lined plate. Sprinkle lightly with sea salt. Combine miso, mustard and rice vinegar in a small bowl. Stir thoroughly; depending on how “pasty” the miso is, you may have to stir vigorously to ensure that it’s somewhat dissolved. Slowly whisk in olive oil until the dressing emulsifies. Alternately, you can make the vinaigrette in a blender. Taste for pepper; no need for salt due to the miso. To plate, spoon salad onto individual salad plates. Lightly dress each serving, sprinkle with pumpkin seeds, and serve immediately. This is my contribution for Souper (Soup, Salad and Sammie) Sundays for the week of February 4, 2013 to February 10, 2013, a weekly foodblogging event organized and hosted by Deb of Kahakai Kitchen. 10 Feb	This entry was published on February 10, 2013 at 12:50 am. It’s filed under food, food photography, Gluten-Free, Souper (Soup, Salad & Sammie ) Sundays, vegan, vegetarian, winter and tagged appetizer, celery, dinner, fennel, food photography, gluten-free, salad, Souper Sundays, vegan, winter. Bookmark the permalink. Follow any comments here with the RSS feed for this post. Fennel is totally underused. Even I love it and I can’t stand anise or licquoice! Usually I find it in the on the supermarket shelf looking bereft and more than a little past its best. It’s great shaved with other fresh flavours – we do a killer spring salad with grapefruit or blood orange and shrimp or the classic arugula and avocado with plenty of lemon juice! – or roasted with peppers and onions for a twist on roasted Mediterranean vegetables. If it wasn’t so darn expensive over here in the UK I would make it part of every meal! Your salad sounds great! Thanks for the ideas! I hadn’t considered roasting it, which makes perfect sense.